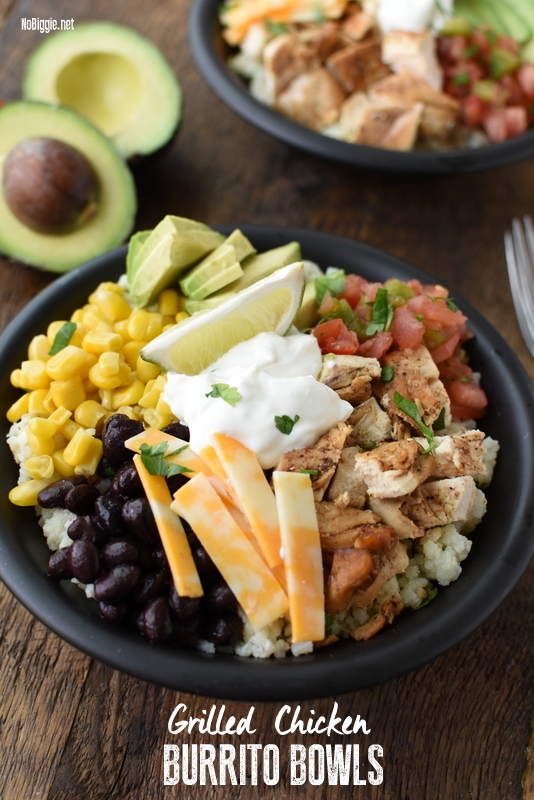 We’re making Cheesy Grilled Chicken Burrito Bowls loaded with avocado, pico de gallo and black beans all served on a big bed of cilantro lime rice. These bowls are so loaded…you won’t even miss the tortilla! After filling up on all the chips and guac, we never miss the tortilla anyway! I’ve teamed up with Cache Valley Creamery to share with you their delicious Cache Valley Creamery Naturals Slices. We LOVE Cache Valley Creamery Cheeses, and they make these burrito bowls awesome! 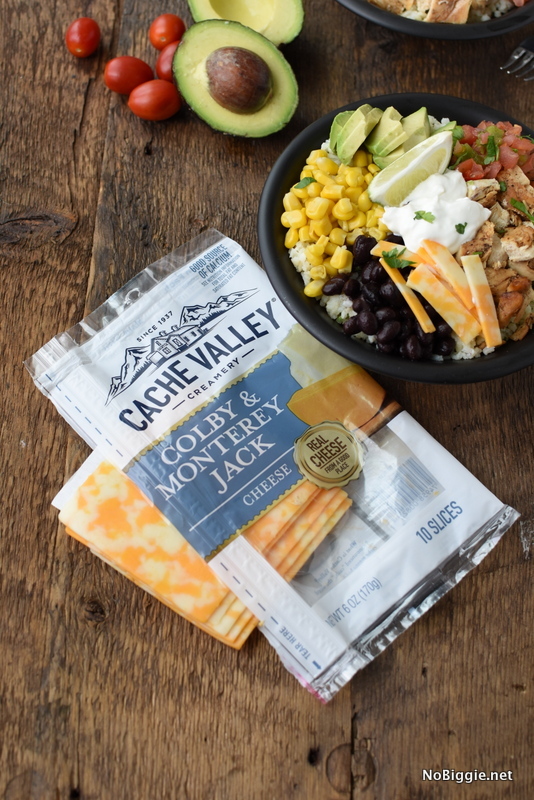 We love the Colby and Monterey Jack Cache Valley Creamery Naturals Slices for these Grilled Chicken Burrito Bowls. 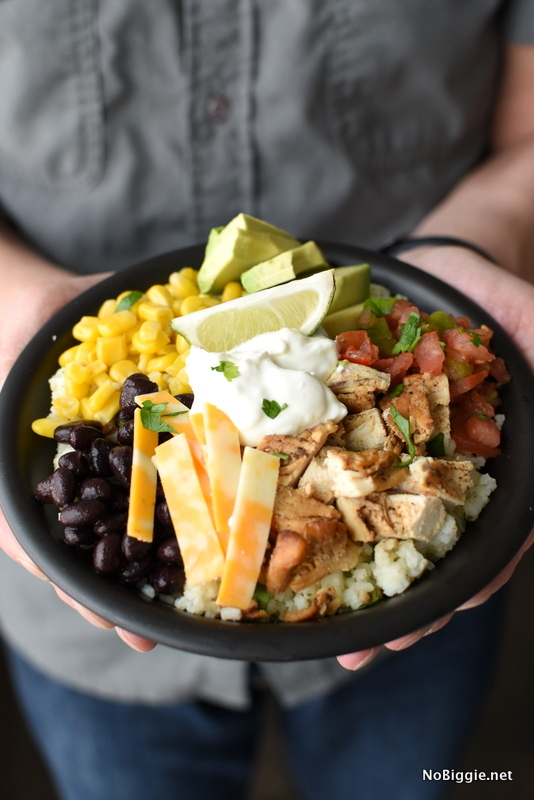 You can either melt the cheese slices over the top of the grilled chicken like we did in the video, or just slice them up and add to the top of the burrito bowl. Rinse the rice and drain. Add the rice and chicken stock to the inner pot of a rice cooker. Steam the rice. When the rice is cooked fluff the rice with a fork and add the lime juice, lime zest and chopped cilantro. Stir and fluff with a fork until well combined. Pound the chicken breasts to even out the thickness using the flat side of a meat mallet. Brush both sides of the chicken breasts with olive oil. In a small bowl whisk together the cumin, garlic powder, smoked paprika, coriander, salt and pepper. Sprinkle this dry rub mix onto both sides of the chicken. Grill the chicken until cooked through, either on an outside grill (6 minutes each side) or pan sear it inside on a well oiled medium sized pan. The center of the chicken should read 165 degrees on an instant read thermometer. Add a slice of cheese to each chicken breast. Transfer the chicken to a plate, cover and let rest 5 minutes , the cheese will melt onto the chicken. When ready, cut the chicken into chunks. While the chicken is resting, slice the avocado. Assemble the burrito bowls, add the cilantro lime rice to each bowl. Top with grilled chicken, corn, black beans, more cheese if desired, avocado slices, pico de gallo and a dollop of sour cream. Garnish with more chopped cilantro and a slice of fresh lime. Serve immediately. Since 1937, Cache Valley Creamery has been offering delicious cheese and butter using only the best quality ingredients to families in Utah and the surrounding areas. Cache Valley Creamery, believes that good dairy products come from a good place. That’s why they take so much inspiration from the people, values, and beautiful landscape of the Cache Valley area, where it all began over 75 years ago. Cache Valley Creamery has a wide range of real and delicious dairy products perfect for every family and every occasion. You can find their cheese chunks, slices and shreds in addition to creamy butter sold throughout Utah, including Walmart, Smith’s, Macey’s, Fresh Market, and Harmon’s – as well as other independent stores. Cache Valley Creamery is teaming up with Real Salt Lake (RSL), Utah’s Major League Soccer team, for the second year in a row as an Official Sponsor for the 2018 season. -If you’re in Utah, be sure to visit them at Carnival Real before the game on April 7 and stop by the Cache Valley Creamery booth at the Mini Foot-Golf Course (outside Rio Tinto Stadium), where fans can sample delicious Cache Valley Creamery String Cheese and spin the Cache Valley Creamery Cheese Wheel for a chance to win fun prizes. Soccer Fans can also buy a gourmet grilled cheese made with Cache Valley Creamery Naturals Slices at the Royal Grilled Cheese Cart on the Rio Tinto Stadium concourse during regular season home games all season long. You can follow Cache Valley Creamery on Facebook here. 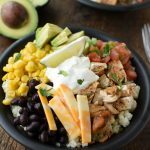 If you love Mexican Food like these grilled chicken burrito bowls, you’ll love our Chile Verde Burritos too! They’re the perfect way to use up leftover pork tenderloin.